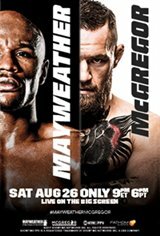 The highly-anticipated showdown, MAYWEATHER VS. MCGREGOR, presented LIVE in movie theatres nationwide on Saturday, August 26. Witness the super-fight that no one believed was possible when legendary undefeated world champion Floyd Mayweather battles UFC superstar Conor McGregor in the most anticipated sporting event of the year. Sparks will fly as the two biggest names in their sport take center stage for a once in a lifetime sports spectacle. Don't miss this epic match for the ages LIVE on the big screen!